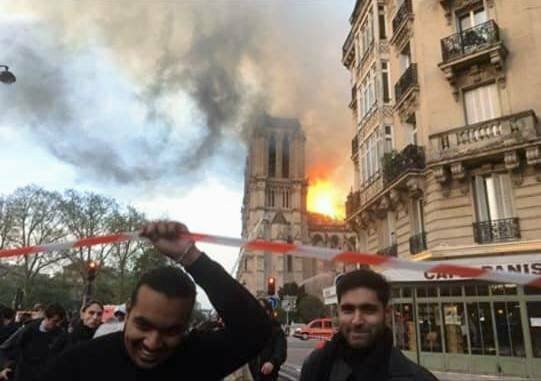 Gas tanks and documents in Arabic were found in an unmarked car next to Notre Dame cathedral, sparking fresh terror fears and at least four arrests, according to French reports. A couple known to intelligence services as being "favourable to the ideas of Isil" were arrested on Tuesday night on their way to Spain, after an anti-terror investigation was launched following the discovery of the suspicious vehicle containing up to seven cylinders on Sunday yards from the cathedral - one of Paris's most visited landmarks. A second couple was detained overnight on Wednesday. Documents in Arabic were reportedly found inside the car outside the cathedral and were "in the process of being translated". The car, a Peugeot 607 with no number plates, contained no explosives or detonators, according to French reports. "They were not linked to any kind of fuse," one source close to the investigation told l'Express. Its warning lights were on. According to BFM TV, one empty canister was found in the back of the car and six full ones in the boot. The type of gas they contained was not specified. And now a small fire in a store room at the Al Aqsa mosque in Jerusalem that "could have been started by children playing in the area." A disastrous forest fire in Chiang Rai, and California periodically burns down. synchronicity or what? Fireman Donald Trump from the NY City brigade recommended to send water bombers to stop things burning. Paris fireman commented this would finally make the building collapse. Fireman Trump further recommended to act " quickly " . You're talking about France. It's the Germans who sweep the walks and scrub their stairs. Sorry, my quip was an opaque reference, to the Fireman Donald Trump previously commenting on a conflagration, in the California place called Paradise, which he named as Pleasant, and further noted that Europe had no such problems as the people they swept the forest floor all the time. Sorry, you apparently pay more attention to Trump than I do. Was international news, and for some reason, my memory won't let it go.